Modern Eden is pleased to announce our collaboration with ARTSPAN as a Super Hub for SF Open Studios 2013. We will be hosting a group show featuring works by 2013 San Francisco Open Studios participants which will run from October 15 – November 2, 2013. 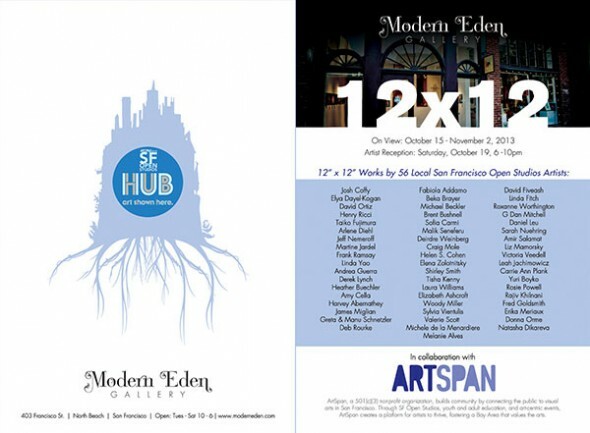 The opening reception for 12×12 will be held at Modern Eden Gallery on Saturday, October 19th from 6-10pm. Featured local artists will be in attendance at the reception. The exhibition will be on display through November 2, 2013 and is free and open to the public.